US Warships Approach North Korea, The War is Begins...!!! 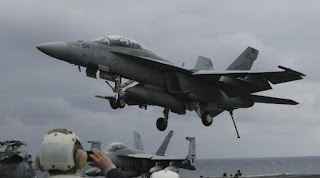 WASHINGTON, D. C. - The squadron of US warships which is devoted to marine offensive operations review doing the movement closer to the western Pacific Ocean near the Korean Peninsula. The Commander of US Pacific Oceans Squadron, Admiral Harry Harris, gives the referrals shown to the USS (United States Ship) Carl Vinson -- aircraft carrier that brought the war equipment and many more, who anchored in Singapore for sailing to the north near the Korean Peninsula on Saturday, April 9, 2017, as reported by CNN today. US news agency explained that the movement was a common thing to do by The squadron of US warships as a form to show the military power. Even the USS Carl Vinson had a history of sail and dock in South Korea for military training in March 2017. But the Commander of US Pacific Oceans Squadron explains that the movement maneuver approach Korean Peninsula doing by the form of provocation just did by North Korea. At the beginning of this week, North Korea did launch scud missile who can be controlled remotely. United States reported that the missile had exploded in the air during flight. The countries who led by Kim Jong-un it also has been tested of ballistic missiles in recent months. The analysts has estimated the tested of ballistic missiles as a form of improving the power of North Korea controlled remotely capabilities. USS Carl Vinson now planned to be operational in the western Pacific Ocean, near the Korean Peninsula. The maneuver approach Korean Peninsula is the new plan changes of US warships. Previously, the aircraft carrier that brought the war equipment had planned to dock in Australia after from Singapore. The squadron who led by USS Carl Vinson it will be controlled by 3rd US Oceans Squadron in Pacific Ocean. MicroSiv™: US Warships Approach North Korea, The War is Begins...!! !